Going on with the list of the best	fall/ winter 2014-2015 fashion trends, we come to the following array of innovations and fresh interpretations being the fall/ winter 2014-2015 accessory trends. What all of them can be described with is the huge diversity of styles and vibes they come adorned with, accompanied with the overall creativity and resourcefulness of designs and great compatibility with many other looks. Thus, speaking about the basic accessory trends for fall 2014, we can point out the versatile and creative alternatives for pieces like scarfs, gloves, jewelry, etc. and the list of the most important alternatives will look as follows! The very first thing that catches our attention here is the oversized predisposition that is given to the jewelry in general. As a rule, everything starts with rings and reaches necklaces and earrings. Another accentuating detail for these pieces are the bright tones they come adorned with. The glittery textures also contribute to the creation of cool and nice pieces. The heavy metallic alternatives presented by Chanel are one of the most noteworthy options in this aspect, followed with the multi-color and figurative variants from Christian Dior, the uber girly and delicate lace-like patterns from Nina Ricci, the super heavy necklaces seen during the show of Vivienne Westwood, the uber elongated and oversized versions from Versace, and the creative alternatives from Lanvin. For even more diversified and creative options, you can also look though the big and colorful jewels by Gucci, Giorgio Armani, and Celine completing the overall diversity and creativity of the range. The gorgeous variants suggested by Dolce & Gabbana make the image even more complete and perfect. The oversized and graphically shaped finger rings suggested by Reed Krakoff and Roberto Cavalli are also noteworthy in this array. Going even further, Alexander McQueen came up with bracelets covering up the whole hand and designed with interesting leaf-like patterns. The tribal inspiration led Etro to suggest other catchy variants of necklaces, coming with three black tassels and matched with colored resin cabochons. In addition, we simply can’t leave aside the curious and catchy bandana necklaces spotted at Isabel Marant also being different from the rest of pieces. The pendant earrings at Oscar de la Renta secure the chic interpretations of oversized motives for earrings as well. The dangly earrings suggested by Emporio Armani represent the other impressive option. Finally, we should also speak about the mirrored collars observed during the Marni show, also being unique and different. This is the following megatrend of the season, found among the collections of very many fashion houses. Lanvin came up with one of the most successful and greatest interpretations and design solutions of this type, featuring some options with simple and minimalistic design solutions, finished off with the elongated chains and the overall noticeably big shapes. As for the shows of Roberto Cavalli and Reed Krakoff, we saw interpretations with jewels picked instead of metallic pendants, looking no less mysterious and beautiful. The padlock necklace suggested by Chanel is the following impressive and cool variant. The next most frequently observed form of jewelry is the huge variety of chokers, coming with a big list of shapes and decorations including metallic details, plastic elements, bright and sparkling jewels, and even fur details. The suggestions seen during the shows of Giambattista Valli and Versace are some of the most impressive variants created with chains. KTZ stunned everyone with the super huge choker while Fendi came up with the fur and fluffy designs for the total glam and chic. For even more luxurious variants we can look through the crystal and big chokers by Balenciaga and the crystal collars at Givenchy. The sculptural chokers suggested by Altuzarra are also noteworthy here. Don’t miss the upcoming	Spring/ Summer 2015 Accessory Trends! Leather proves to be super effective and cool for jewelry as well. The stunning leather bracelets that are presented during the fashion show by Fendi come to prove their universal nature and perfect versatility for combinations once more. The combinations of leather pieces with furry elements spice up the looks additionally. In addition, we can also speak about the belt bracelet by Cynthia Rowley being catchy with the bicolor interpretation and the catchy looks. The following trend we would like to note is the one formed with the elongated and sometimes even excessively elongated chains and beads observed during many fashion shows. For instance, such were the suggestions by Vivienne Westwood and Roberto Cavalli, during the shows of which we observed some fantastic pieces ideal for any party coming as metallic, plastic, wood, leather, and textile type of accessories with lengths sometimes reaching the knees. The fans of the luxurious golden details can have fun to the full for the coming season, since one of their most fave type of pieces is again having a moment for the season, coming with the most curious and creative interpretations and shapes ever, including geometric options, rounded and oversized looks, and many others. The Creole hoops presented by Balmain are the following catchy options of this type. The sophisticated and chic variants found during the Celine show can also be noted in the list of top impressive exemplars. The key-shaped alternatives we saw during Louis Vuitton fashion show are the next resourceful and great options. The curious triangle forms suggested by Saint Laurent form the next aspect of this diversity. The necklaces at Maiyet are also worth mentioning here. However, saying golden, we should speak about the exaggerated proportions of golden accessories observed during the Moschino show, where a whole conglomeration of chains, bracelets, necklaces and other details came out for a single look. The medallion cuts at Versace are also worth mentioning in the fantasy of golden details. Speaking about the other creative and cool interpretations of the designs the jewelry had for the coming season, we should definitely note the uber chic and cute Floral Neckline. Presented with the all-floral shape, it joins the benefits of the resourceful shapes with the impressive looks, coming with incredibly chic and innovative design solutions and generally monochrome looks. Thus, we can note the awesome options by Dolce & Gabbana, Dries Van Noten, the tribal inspired variant by Givenchy, the sweet and cute version by Simone Rocha, the floral ornaments by Celine and Fendi, the luxurious interpretation of Oscar de la Renta, and many others. The very first option we would like to speak about is the fur scarfs coming with the maximum chic and comfy shapes and designs thus securing the warmth and the good looks at the same time. We should especially note the elongated fur scarfs, deigned with the most luxurious and sumptuous types of fur possible. The color palette is extremely diverse for these options, coming with tones ranging from cool and soothing to bright variants. The fashion shows of Tod’s, Fendi, Michael Kors, and Asos are some of the most impressive variants. Other comfy and cool scarf variants presented during the recent fashion shows are the knitted ones, which again nicely combine the useful and good-looking features in one look. The patterns and the lengths of the scarfs we saw during the shows are diverse in textures and designs, suggesting a big variety of style for completing any look. Some of the most noteworthy alternatives of this type were the options by Marc Jacobs, Etro, Sonia Rykiel, Prabal Gurung, and Undercover. The light and weightless forms of scarfs at times also turning them into kerchiefs can also be noted in the basic fashion trends, found with a nice diversity of looks in the fashion shows of Prada, Alexander Wang, Burberry Prorsum, Sacai, Givenchy, Christian Dior, Emilio Pucci, Gucci, and Ralph Lauren. Another season is marked with the long gloves being the fave of the designers. They are one of the most impeccably chic accompaniments to evening looks, accentuating the feminine charm of any lady from a different perspective. Thus, some of the most noteworthy options of this type can be found in the collections of Vera Wang, Altuzarra, Band of Outsiders, Christian Dior, Daks, Dries Van Noten, Dsquared2, Erdem, Irfe, Fendi, John Galliano, Rachel Roy, Vivienne Westwood, and others. Along with the classy interpretations we can also consider the lavishly decorated and glittery options suggested as a major style innovation for the season. The options by Dolce & Gabbana are, for instance, the example of the rich use of jewels and golden textures, while the delicate options from Lanvin are noteworthy with their sheer texture. The creative variants from Haider Ackerman and the nicely textured alternatives of Rick Owens, Rochas, and Dries Van Noten can also be noted in this array. Shorter forms of gloves are no less impressive and cool for the coming season. Some of the best examples could be seen at the fashion shows of Rachel Roy, Emporio Armani, Dsquared, and Agnes B. Especially cool and resourceful are the alternatives by Chanel and Dolce & Gabbana. Few people know that mitts appeared before gloves and for this season they are enjoying a nice comeback to fashion world, characterized by new and fresh interpretations and creative design solutions. Thus, you can look through the variants by Dolce & Gabbana, and the sporty with stylish versions by Kenneth Cole. 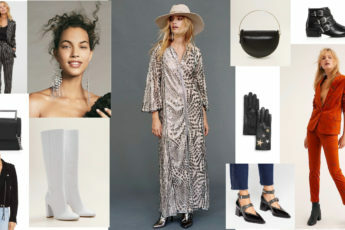 Along with the innovated and renovated shapes we can also see some neomodern interpretations of gloves for the coming season as well, which are described by the extreme extravaganza and chic. Such were some of the looks we saw at Lanvin show, the sassy and fluffy version of Rochas, the reptile skin patterned alternatives of Balenciaga, and the mysteriously chic designs from Vera Wang. Here were the main fall/ winter 2014-2015 accessory trends and vibes that we noted during the fashion shows! If you would like to spice up your looks with the most stylish and creative accessories and designs, then looking through these trends will be really useful for your best choices. So browse through the looks and get inspired!